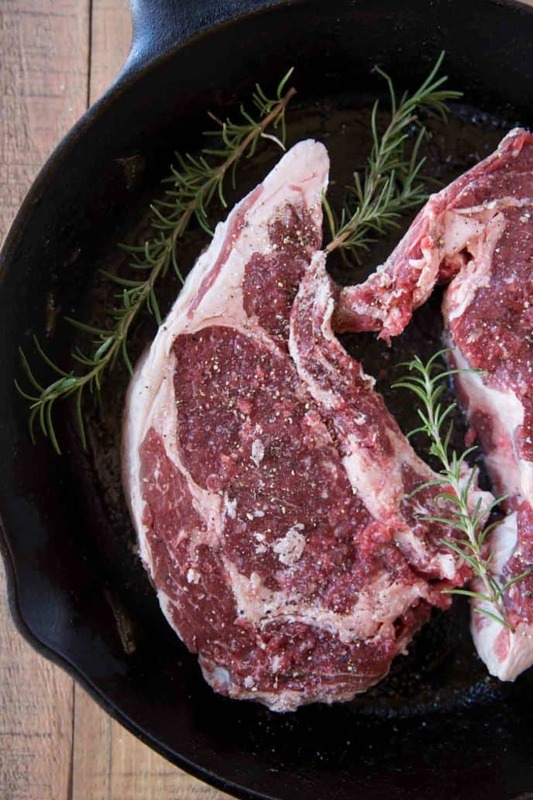 Perfect, Easy Ribeye Steak that’s butter basted in a cast iron skillet with Rosemary. An error-proof medium rare in 20 minutes including rest time. 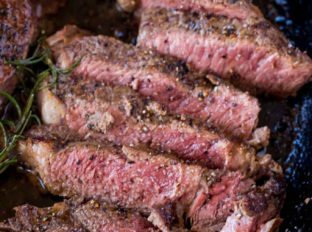 The Perfect Ribeye Steak without a grill is made in a cast iron skillet and basted with herbs and butter. Yep, I said in a pan! Plus if you don’t want to use herbs you can even just add salt and pepper and use my A1 Steak Sauce (Copycat) recipe. 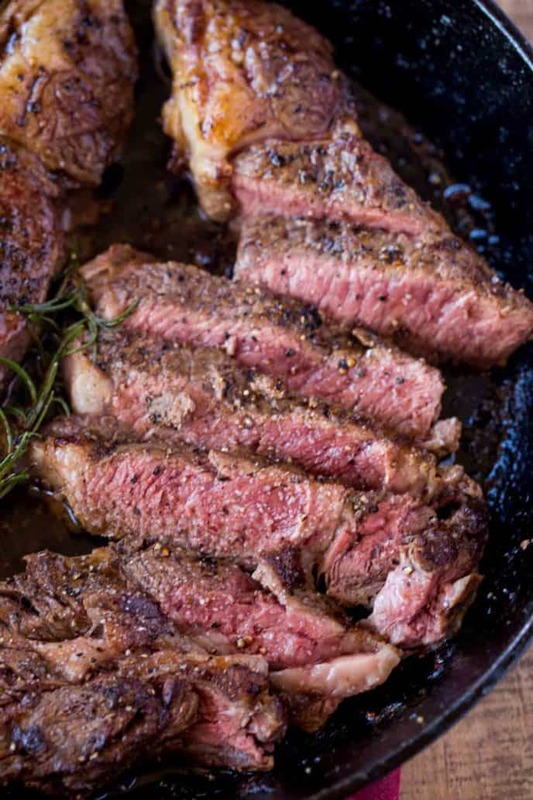 Cast Iron Skillet Ribeye Steak only takes five minutes to actually cook. It will actually take you longer to get the oven preheated than to cook your meal. 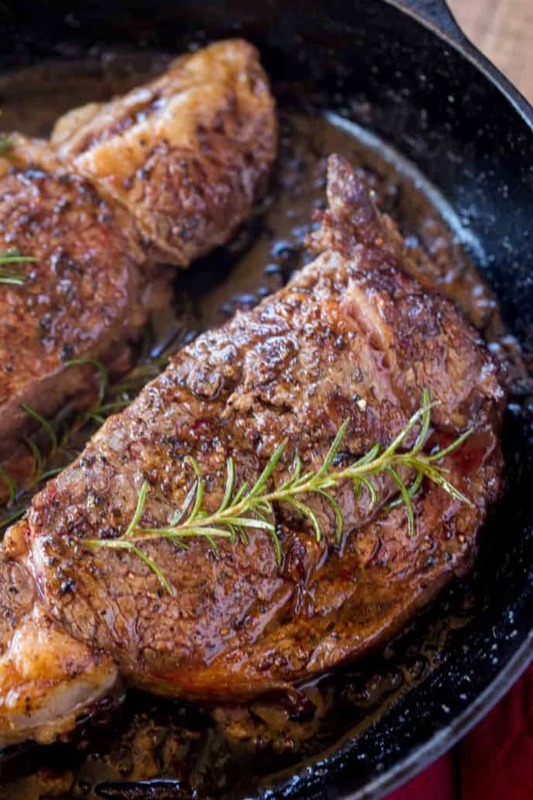 What are the benefits of cooking in a cast iron skillet? The searing in butter is, let’s face it, pure flavor. Getting a good sear on the steak is essential to the flavor, then the oven finished the cooking process on an even heat. Why not cook the steak completely in the skillet? If you were to cook the steak through in your skillet the direct heat would overcook the outside of the steak to the point of toughness. 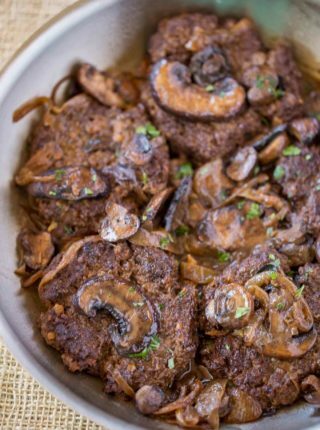 This would result in a less tender crust on the steak as well as it being much drier. This red center runs through most of the steak because of the even cooking of the indirect oven heat finishing off the cooking. Why use a cast iron skillet? Cast Iron Skillets are great conductors of high, even heat. If using a thin skillet you could scorch the pan or the steak. They also are nonstick when heated properly so the steak won’t stick to the pan. Finally, they’re perfect for finishing a dish in the oven. Ask your butcher for a cut from the center of the rack if possible. The bigger the deckle the more flavorful. The deckle is the chef’s cut of the whole cow. 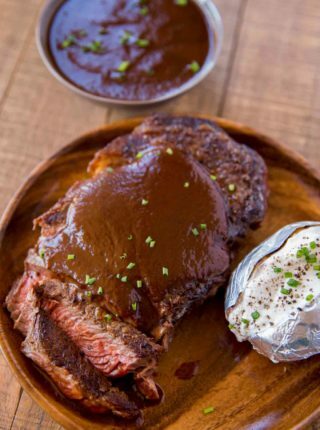 It is the rib cap that wraps around the top of the steak, over the center eye of the steak. Ask for a thick, 1 1/2 inch cut of steak. You want a good thick cut to give you time to sear your steak and finish in the oven without overcooking. Season with a Kosher salt or sea salt and coarse ground black pepper. Using table salt and black pepper is just not going to give you the same flavor and will actually taste too salty. Cut the meat against the grain as you can see in the picture above. 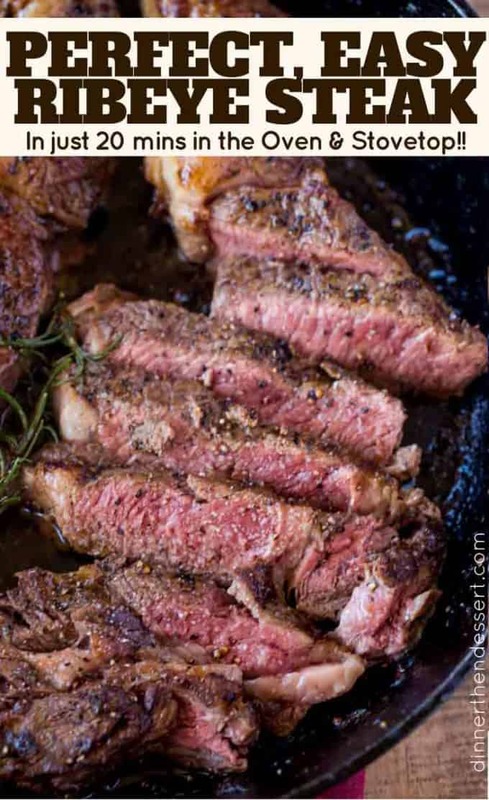 Perfect, Easy Ribeye Steak that is butter basted in a cast iron skillet in the oven with Rosemary. A Perfect error-proof medium rare in 20 minutes including resting time. Add the butter to a cast iron skillet on high heat. Add the Kosher salt and black pepper to the steaks and add to the pan. Sear the steaks on high heat for 30 seconds on each side. Add the rosemary sprigs to the top of the steaks and spoon over the butter onto the steaks. Rest for five minutes before serving. Made this for dinner today, excellent instructions! I’m new to cast iron cooking, this is exactly what I was looking for. Simple and delicious! They only thing I would do differently next time is cook it in the oven a little less, maybe 3 minutes but that’s just because I like steak a little more rare. Question: should I not try this cooking method if I don’t have a cast iron skillet. You should be okay as long as you’re using an oven safe skillet. Good luck! Thanks for the rib eye timing on it tonight wish me luck. In order to properly heat the cast iron pan, I would suggest putting it in the oven and remove when the oven reaches 500 degrees. This will ensure hot and uniform heating of the pan. Hello, you said, An extra minute for medium and 2 extra minutes for medium well ? How would you get one well done with your method? My suggestion would be to cook it at 450 degrees and check it at the same time….it may need an additional minute. 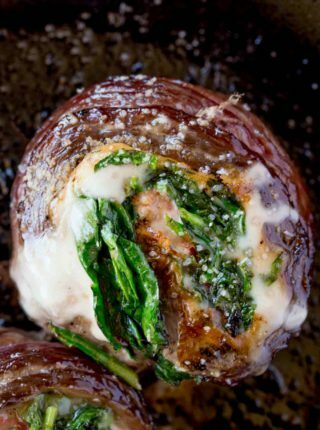 About to try this recipe at this very moment, I’m sure it will be delish! Thanks for sharing your recipe! All I have is cast iron griddle and cast iron Dutch oven. Will either of those work?? I would think the cast iron dutch oven would be better because the flat surface would be better for browning. Good luck! Better than our local steakhouse! Best ribeye I’ve ever had! Heat the cast iron skillet in the oven to ensure even heating; doing it on the stovetop won’t get the pan heated evenly. 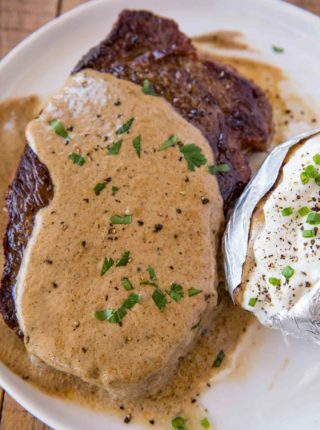 Just pop the skillet into the oven as you’re heating the oven, then take the pan out when the oven reaches 500 degrees and continue as you instructed by searing the steaks in butter and finishing cooking in the oven. If you want your steak more of a medium instead of medium rare, how much longer in the oven should i cook it? I prefer my steaks medium to medium well. How long will I need to cook them in the oven to reach my desired doneness? An extra minute for medium and 2 extra minutes for medium well 🙂 Enjoy! I totally agree that this method is the BEST! Can’t wait to try the rosemary! This lucks delicious, but my stove is an electric glass top so I can’t use cast iron. Do you think it’s worth trying with my regular stainless steel cookware? I’m hesitant to just give it a try given the price of beef… Thanks for any help! If your cookware is good quality and you’re able to get it really, really hot, this should still work. 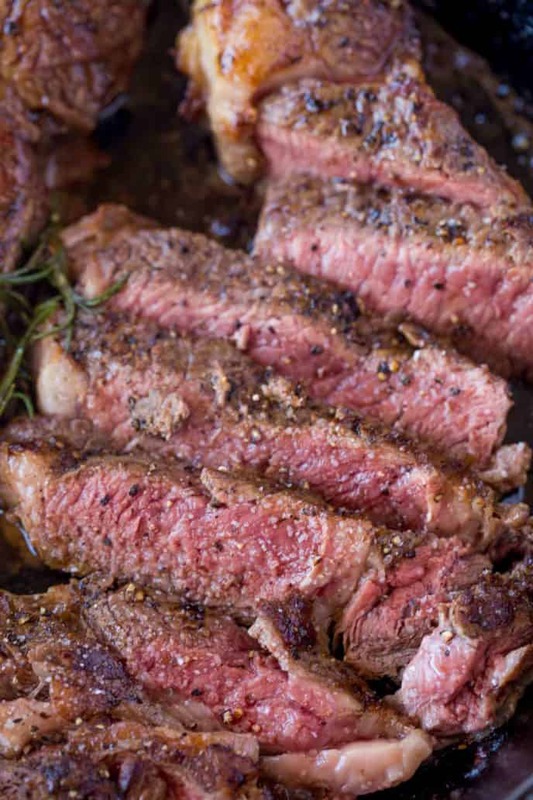 You just want to get the best possible sear you can. Good luck! I have an electric glass top and have always used my cast iron on it and just used my new Field pan on it, and wow, is it awesome. It helps that I always use grass fed beef from small farms. Much better than supermarket meat.